Voice-activated digital assistants have already made quite the splash; debuting on our mobile phones, computers, smartwatches, in our cars, and even in our homes. 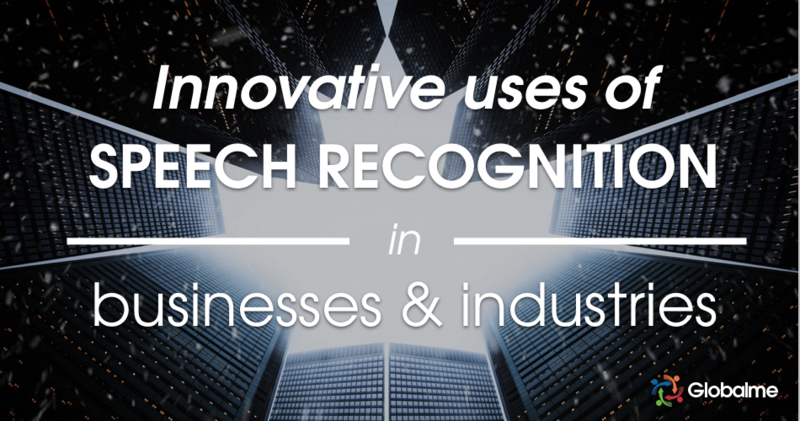 Now, the uses of speech recognition range from the realms of finance, HR, marketing, and even public transportation with the goal of bringing down business costs, simplifying outdated processes, and increasing overall efficiency. With impressive (and growing) improvements in natural language understanding and speech accuracy rates, the technology (backed by tandem improvements in machine learning, big data, cloud processing and artificial intelligence) has led to a growing appetite for companies to continue building voice-enabled experiences that go even beyond the private domain. Today, only a few people (typically in high-up positions) have their own personal assistant. With the introduction of AI digital-assistants in the office, everyone can have one. From asking Cortana to find a long-lost budget report, to asking your Google Assistant to please create a graph showcasing the year’s growth in click-through-rates – the use-cases for implementing digital-assistants in the workplace are far reaching. Voice could very well replace manually going through files on your computer in the same way that electronic documents so easily replaced paper records just a short time ago. Instead of typing out company correspondence, it will all be dictated to a computer that will generate flawless documents. Office security will be strengthened by using voice recognition instead of swiping cards. Long data entry processes might become redundant with artificial intelligence taking over. Wherever you go, the lighting and temperature controls all perform in concert to optimise your comfort based on your pre-determined personal indicators. Ultimately, increasing overall office productivity. In late 2017, Amazon announced new voice-activated tools for the workplace, hoping that verbal commands such as, “Alexa, print my spreadsheet,” would be introduced to replace common office tasks. Dubbed Alexa for Business, users will be able to issue voice commands to begin video conferences, access calendars and print documents, manage individual and shared Echo devices, as well as a multitude of other common workplace functions. “You no longer ever have to dial in a conference ID,” Amazon’s Chief Technology Officer Werner Vogels said, “Just say ‘Alexa, start the meeting.’” The functionality, similarly with inside your home, can be accessed through Amazon Echo speakers. Microsoft’s Cortana has similarly begun to manage some of the more onerous office tasks such as: scheduling meetings, recording meeting minutes, and making travel arrangements. Down the line, Microsoft officials have indicated a conference room where Cortana greets meeting participants, assists them in joining a scheduled meeting, transcribes meeting notes, recommends documents, and reminds people of the names and titles of meeting participants. However, with Alexa and Cortana’s partnership (allowing Alexa users to access Cortana and its capabilities, and vice versa) announced in the summer of 2017, Alexa seems to be moving faster than Microsoft imagined. The partnership allows Alexa (and in turn, Alexa for Business) to integrate with Office 365 and other Microsoft programs – just like Cortana. It will be interesting to see how Microsoft and Cortana will differentiate themselves in the space down the line. WeWork, a co-working space company, was quick to hop on board with Alexa for Business, and has been using and testing the platform’s capabilities since October 2017. Users can utilize the ‘ask WeWork’ skill to extend a meeting room reservation, to see which meeting rooms are empty, or ask when the next meeting in that room is scheduled to start. Users can also dim the lights or turn them on or off. The real magic of Alexa is in integrating and working with third-party app and hardware developers. WeWork has begun experimenting with this in the workplace, and has integrated Alexa for Business with Zendesk, so users can submit tickets in the room using voice-commands. One of the main understood benefits for voice recognition technology is its ability to enable those with visual impairments the same access as those who aren’t visually impaired. However, companies investing in speech technology have also begun to make strides in removing language barriers. Microsoft’s Skype Translator offers help with communicating more clearly with people around the world. Though their voice translator is currently only available in eight languages, their text translator is available in more than 50 languages for instant messaging. Utilizing the wonders of machine learning, Skype Translator listens to and learns your spoken and written patterns; the more you use it, the better it gets. A host of Kickstarter campaigns such as Waverly Labs have also begun to make headlines, with the promise of “a world without language barriers” through the introduction of real-time translation earphones. With $5 million in Pilot pre-orders (and growing), the company has some big expectations to live up to. There is, however, a problem with speech recognition technology to take into account – these systems are being built for standard speech. Thus, leaving out the millions of people who live with speech impairments, or even those who have a strong accent. A voice-recognition company, Voiceitt, has stepped up to fill the gap with its assistive technology. Based in Tel-Aviv, the company has raised $3.8 million (as of January 2018) in seed funding to help translate speech that’s not easily intelligible into clear sentences. Once you have the app open, the software asks the user to compose and record short, useful sentences out loud such as, “I’m thirsty,” “Turn off the lights,” or “I’m cold”. The app records and begins to learn the speaker’s particular pronunciation, utilizing machine learning to become more knowledgeable with every usage or repetition. After the training period, the Voiceitt app can turn the user’s statements into normalized speech, which it outputs instantaneously in the form of audio or text. The project already has huge public support – expect to see it out in the wild very soon. The implications of real-time translation is not only vastly important for public life, but also for businesses. Imagine the partnerships that can form if language is no longer an issue; the innovations that could come out of merging different cultures. We already know diversity is a huge benefit to businesses today, and perhaps this will take that to the next level. Of course, this technology should most definitely come with a caveat – businesses would then have to have complete faith in the technology that they’re using to translate their words and the meaning behind them perfectly. After all, we know how important localization is when disseminating messages across cultures. “Though it’s still early days in terms of adoption, banks see great promise in voice-activated solutions,” reports Phil Goldstein of BizTech. “Why tap on your smartphone to get your checking account balance when you can just ask Alexa?” As far as use-cases go, banks see the value in voice-based banking in reducing the need for human customer service representatives and in turn, reducing staffing costs. Having access to your very own digital banking assistant on your mobile phone could also boost customer satisfaction and retention. And, who wouldn’t be happy with never having to stand in line at the bank ever again? At the same time, USAA announced the ability for Amazon Alexa to help USAA members access information about account balances, transactions, and spending patterns. Designed to provide a conversational experience, the pilot program also aims to help answer some of the most frequent and basic questions and thus free up time for service representatives to answer more pressing member phone calls. In a press release, U.S. Bank also announced their embracing of voice-technology. Customers can now check their account balances, hear payment due dates and the amount due, obtain account transaction history and make payments by speaking to an Amazon Alexa device. While ease of access is all fine and dandy, security should be front and center when it comes to utilizing voice technology in the banking industry. We’re talking about our life’s savings, after all. Not only that, but if a voice-assistant is not trained in financial terminology or the bank’s specific processes, the customer could have a poor experience overall. “So much of HR work is transactional, repeatable, auditable and documentable – that is what bots are great at,” says Jason Averbook, CEO of Leapgen, and a specialist on workplace technology. With voice-technology (and a little bit of artificial intelligence), HR professionals could simply ask Cortana to scour different recruiting databases and applicant pools with just a few words. Similarly to in the realm of HR, marketing professionals would benefit from voice-assistants helping them with scheduling social media posts, creating reports, and so on. Voice is also a new medium yet to be investigated by advertisers (outside of Podcasts and radio, that is). Companies have started exploring ways in which this shining new industry can be utilized to help improve their customers’ experience – and of course, more ways in which the brand can get in front of them in general. Starbucks’ Reorder skill for Alexa allows customers to, well, order steaming hot cups of java; Hyundai built a Google Home integration to start your car; and Tide built an Alexa skill to help walk you through removing delicate stains. It seems that voice is becoming a genuinely useful form of communication from brand to consumer – let’s hope it doesn’t become oversaturated with unnecessary (and unwanted) advertisements and marketing schemes. Have you ever walked up and down every single aisle of a store only to huff in frustration at not having been able to find the item you’re looking for? Consequently, you then have to walk up and down every aisle once again to try and find someone who works there to help you out. Right off the bat, it seems as though retail is an industry which could capitalize on voice-integration. Aside from shopping in physical brick-and-mortar stores, Amazon has already made big investments into their customers’ online voice shopping experience. With Amazon’s suite of Echo devices, users can ask Alexa to be their shopping partner-in-crime. If you tell Alexa to reorder your rubbish bags, she’ll just go through Amazon and order them. In fact, you can order millions of products off of Amazon without ever lifting a finger; a harrowing fact for its competitors especially considering that Amazon by far commands the largest share of the voice-hardware market. Amazon will become an ever-more important platform for shopping. 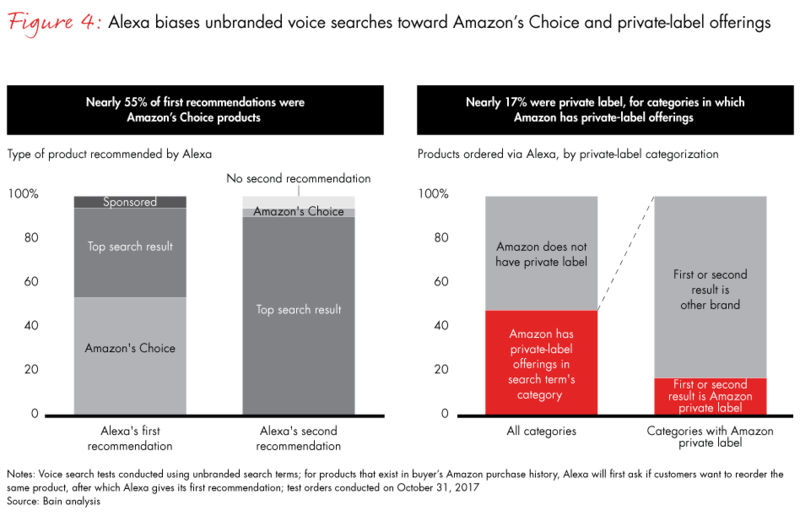 A recent study found that when shoppers are using Alexa to search for an unbranded item they haven’t previously purchased, they tend to be steered toward certain products. First and foremost, users are steered towards Amazon’s namesake shopping platform, where “Amazon’s Choice” products are recommended. While “Amazon doesn’t disclose how it chooses these products… the process likely combines sales, Prime eligibility, ratings and rates of return,” states Bain & Co. When an Amazon’s Choice product isn’t available, Alexa recommends the top search result instead. Amazon also first recommends private-label products (products which are Amazon-branded) above others. Surfacing (or not surfacing) as one of Amazon’s Choices will affect replenishment purchases (such as laundry detergent, dish soap and rubbish bags) more so than clothing retailers, for example. It’s hard to imagine someone agreeing to purchase a jumpsuit without laying eyes on the product, checking the sizing chart, and so on. However one thing’s for sure: just as it matters in Google’s search to rank for SEO, it’s going to matter a great deal in voice if you’re one of these first or second recommended products. Third-party apps and devices have already been jumping on board to integrate with some of the major voice-assistants out there. Users can easily ask Alexa to “book an Uber,” knowing that she will go ahead and do just that. However, some companies, such as Passenger, are working on more integrations to help put public transportation on voice-platforms. With the dream of allowing users to simply ask questions like, “When is the next bus to work?” or “How do I get to the gym?” your voice-assistant can utilize the existing transport network information stored online or on the cloud to best answer your questions. Last but not least, voice technology has also entered the realm of crime-scene investigation. Researchers at the University of East Anglia are trialling visual speech recognition technology that could reconstruct conversations captured on video even where there is no sound. With this slightly different form of speech recognition technology, developers are concentrating on training machines to recognize the appearance and shape of humans’ lips as they form words and sentences. Though this is a bit out of Alexa, Cortana, Google Assistant and Siri’s breadth of knowledge, it aims to solve “one of the most challenging problems in artificial intelligence,” says Professor Richard Harvey, of UEA’s School of Computing Sciences. Voice recognition and the artificial intelligence behind it is only going to get more sophisticated going forward. The industry is already saturated with hundreds (if not thousands) of companies experimenting with integrating their products and services with digital voice-assistants. As such, the uses of speech recognition have also begun to range into the world of entertainment; impacting other new technologies such as virtual reality and biofeedback in voice-controlled video games, as well as radio show-esque voice-activated mobile apps. If you’re interested in learning more, take a look at our complete guide to speech recognition technology. Interesting points. I’ll add one that is more a personal ideal: It won’t be an easy task, and it will take time, but we can now envision a world where you wouldn’t need to be able to read or write in order to access data and information from the internet. Speech recognition can help us redefine literacy – Except that for now, there is absolutely no commercial benefits to be obtained from developing such solutions for those who need it most. But using speech recognition to bridge the digital divide would have a huge societal impact. It might also help save some endangered spoken languages from becoming extinct.